Holders of EU, USA and Canadian passports do not need an entry visa to Israel. For participants from other countries, we suggest you check with your travel agent or local Israeli embassy/consulate. The procedure may be lengthy and it is recommended to apply for a visa approx. 3 months prior to the Conference. All visitors to Israel must hold a passport that is valid for at least six months from the date they enter the country. Please contact the Conference secretariat at meetings@diesenhaus.com to obtain a letter of invitation to assist in applying for a visa. Additional information on visa requirements can be found on the website of the Israeli Ministry of Foreign Affairs. The weather in the Jerusalem in June is hot. No rain. Temperatures range from 28°C - 18°C (82°F - 64°F). Casual dress is appropriate for all Conference occasions. Comfortable walking shoes, sunglasses, hats, suntan lotion and swimsuits are recommended for tours and outdoors activities. Ben-Gurion International Airport is served by many daily direct flights from most destinations. El-Al is Israel's national airline carrier. The currency unit in Israel is the New Israeli Shekel (NIS – "Shekel” in short). International credit cards are accepted for payment in most hotels, restaurants and shops. Exchange offices and ATM machines are easily available throughout the city and at Ben-Gurion International Airport. We recommend that you change some money at the airport for immediate needs. Banks are open Sunday through Thursday 08:30-12:00, on some afternoons. Some bank are open also on Friday mornings. Hours vary by branch. All banks are closed on Friday afternoon and on Saturday. The New Israeli Shekel (NIS) is the official currency in Israel. Foreign currency of all kinds may be exchanged at the airport, banks, post offices, most hotels or licensed exchange agencies. Participants are advised to purchase comprehensive travel insurance coverage. The organizers and/or Diesenhaus-Unitours Incoming Tourism Ltd. shall not be liable for any loss or damage to property belonging to Conference participants nor for personal injuries sustained during or as a result of the Conference or during tours. Stores are generally open Sunday through Thursday 09:00-19:00 and Friday 09:00-14:00. Most shopping malls are open also on Saturday from one hour after sunset until 22:00. All Superpharm and Newpharm stores include a pharmacy. Jerusalem, the unique city cherished by millions of people throughout the world, is a spiritual center of great interest and beauty. Jerusalem the ancient ... with numerous holy places and treasures that have drawn pilgrims and tourists throughout the ages. Jerusalem the modern ... a thriving city that offers both the mystery and magnificence of the past and the luxury and efficiency of the 21st Century. 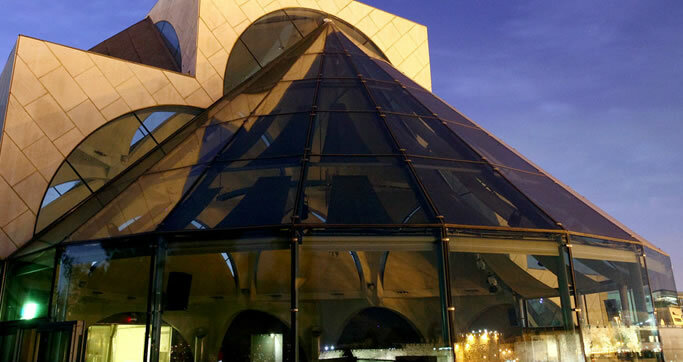 The conference will be hosted in Beit Shmuel conference center, Conveniently located within a short walking distance from the Mamilla open air shopping mall and Jerusalem’s city centre. Details: 6 Eliyahu Shema St., Jerusalem. Phone: +972 - 2 - 620 34 55.